Hand Crafted Sterling Silver Trumpet Flower Earrings, "Nature's Trumpet"
Artisan Nyoman Rena of Bali presents dangle earrings that depict graceful trumpet-like flowers. The earrings are crafted of sterling silver and beautifully detailed, from the delicate stamens within to the petals' curled edges. 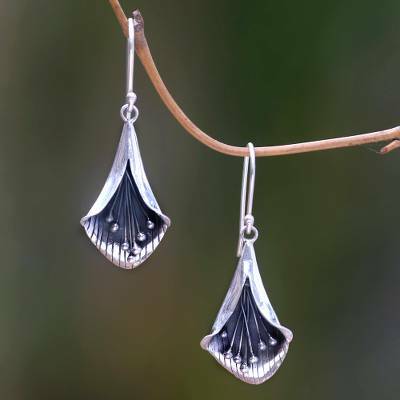 You can find sterling silver dangle earrings 'Nature's Trumpet' by Nyoman Rena in jewelry categories such as Floral Earrings, No Stone Earrings, Silver Earrings, Sterling Silver Earrings and Dangle Earrings. Enjoy exploring these sections for other Novica treasures. These are even more beautiful thzn the picture. I am so proud to wear them. this was a present for a dear friend and she loved them. These earrings are awesome! I enjoy wearing unique earrings daily, whether for work or just around the house. Your work is superb. I can't decide what pair to wear. I look forward daily wearing your jewelry. It's an honor to wear such talent. Thank you from my heart. "Nature's trumpet - a pretty gift." They are beautiful - Bought as a gift and not given yet. Hope she will love them. "Enjoy wearing a touch of nature"